A story I wrote for the Moth Magazine Children’s Short Story Competition, but finished too late for submission. There was a time when Angel was very young, when she found herself alone, when all of her friends were whisked away to far away places, and she stayed at home. “Well that’s quite simple, you’re too young to go travelling,” he said. Harry took off his backpack and began to rummage. He pulled out underwear, a toothbrush and swimming shorts. He looked embarrassed. “I didn’t realise,” she said, stifling a laugh with her hand. She felt guilty, laughing at his shorts. But they were loud, Hawaiian themed, the sort an older boy or man would wear. He pulled out a magnifying glass and pretended to be Sherlock Holmes examining something for clues, before returning it back to his bag. Next he hauled out a large plastic pack. “My meds,” he said, putting the package to one side. Harry handed her something that looked like an old sock. The sock felt heavier than a normal sock and was quite bulky. She felt the contours of an object inside, not a heavy thing, but something fine and flimsy, something that needed protection. She slowly rolled back the sock, until its innards were exposed. Harry looked at her with a: what do you think Angel expression on his face. Although she had no idea what this fragile thing was, she felt special all the same. Harry was entrusting something precious to her care, and that was extremely unusual. Harry was particular about his stuff, he never let it go, never loaned it out. “I really don’t know what this is,” she said immediately regretting her words. But Harry didn’t notice; when he was on a roll he rarely noticed things like facial expressions or the small verbal hints people drop– he just bulldozed on. “I promise,” said Angel with as much conviction as she could muster. The object in her hand looked like an ordinary glove, except it had wires protruding and wrapped around its outer skin. Harry is three years older than Angel, yet they are the same height; in fact, Angel is a few centimetres taller, but this is disguised by the large baseball cap permanently affixed to his head. When they first met Harry explained that he’d been born premature as a baby and had spent months in an incubator, which was a little like a spaceship. Being premature affected his body in many weird and wonderful ways; it gave him special powers, and that’s why along with all sorts of wonky and different kids, he went to a school far away. He was collected every day and returned by a special bus. Harry left early in the morning and returned long after Angel had finished her tea. But weekends were different, then they played like regular kids. Angel took the thing in her hand, she felt a shivery, tingly feeling rush up from her wrist to her shoulder, and then over to the other. The shiver moved quickly back and forth back and forth, then disappeared down her spine. “Phew,” she said as the sensation exited close to her coccyx. “You wont believe me when I tell you about my silver machine, yes that’s what its called. Don’t ask me how or why, because it’s a name that popped into my head when I made it. “So it’s a magic glove,” she said. Part of Angel still thought Harry was playing some complicated practical joke. At the last minute she expected him to break out into a huge grin, before collapsing into a ball of laughter. Instead he became serious, hugged her in his awkward wooden way and disappeared over the fence. Harry left later that day. She watched from her window as his parent’s car drifted down the street. She watched until there was only a tiny pinprick left of their small and compact car. Harry had no friends but her. She knew this because apart from his Mum and Dad, and some relatives who lived in Scotland, he never mentioned anyone else. If he’d made any at school, they were forgotten once he was on the bus home. She even doubted their friendship sometimes. Harry often acted strange, and was in a world of his own according to her Mum. He wouldn’t hear things she was saying, and he’d forget important stuff like her birthday. He was better with Christmas and Halloween though – festivals that involved dressing-up really excited him. If her friends from school or five a side football came around, Harry would vaporise – that was his word for disappearing to his shed. The shed was so special, only his dad was allowed inside. It was the place where he invented things. Harrys dad designed packaging – dog food and cat food boxes mostly, but he had also designed the cover of a sci-fi book long before Harry was born. Harry said his dad didn’t even like animals, but the job was steady and less precarious than his old job – he never explained what this old job involved, but she guessed it was something like a high wire act – that was precarious. “With these fair hands,” he said, sounding more videogame character than human. That night she placed the machine in her special blue box, the one secreted beneath her bed. It sat in her pile of precious things. The shells she’d collected last summer when the weather had been unusually hot and her mum had taken time off work so they could go to the coast. The glint of silver matched the shine of her special spoon, a gift from some unknown relative, long ago. It contrasted with the gold of dads watch and cufflinks – magic things from another life. Angel locked the case and pushed it under, out of sight. The key she secreted in a secret place. She wanted to keep the glove safe, not because of its value, or because Harry would never forgive her if it was lost, but because she feared its powers. What if it makes me shake all night long she thought; what if I’m so tired I can’t get up in the morning. She chose to keep Harrys magic thing a secret, just in case it got them both in trouble. She thought about the boy who’d lived next door before Harry – a not so nice, horrendous boy called Lawrence, who she called Florence – when he was safely out of earshot. Lawrence specialised in flower mutilation, and he kept a special pair of secateurs for the job. She never discovered the hiding place, because unlike Harry, Lawrence never spoke to her – he just grimaced and chopped. Then he moved away, and the flowers grew back, erasing the memory of horrible Florence. more than nothing – the magic machine barely caused a murmur. Angel liked to think of herself as careful, cautious, not a person who makes rash decisions – like wearing something she’s not supposed to wear. Harry was always super careful about everything. He filed and catalogued all his possessions like a librarian – a librarian of things he liked to say. The day after Harry left Angel was sent to play-centre, where she tried to have fun and forget about the rain outside – but its constant drum and shivery coldness made it difficult to ignore. She made friends with Molly, a girl close to her age, who asked for nothing but her company, and the occasional bite of chocolate from her packed lunch. Molly’s parents were raw food vegans and disapproved of all manufactured food, especially snacks. During that first rainy week Angel kept to the promise she’d made to herself: keep the silver machine safe and away from temptation. She now understood how difficult it was for Molly, resisting chocolate. When the second week started, there was no sign of Molly. The play-workers just shrugged their shoulders when she asked about Molly – she’d vaporised. Angel needed something comforting, to offset the disappearance of two friends in the space of a week; she needed something tempting, like a hundred tons of chocolate. That night she unlocked her box and took out the silver machine – it glowed in the half light of her bedroom. She instantly felt the shivery, tingly feeling; felt it move across her shoulders and run down her spine. “Phew,” she said to no one, before quickly slipping the machine beneath her pillow. As the night progressed she found herself thinking more and more of going to bed. Any thought of staying-up late because of the holidays, vanished. Instead she tried to think of a plausible excuse for going to bed early – feeling tired would sound really lame, but it was better than faking an illness – down that path lay thermometers, hot lemon and horrible tasting medicine – so lame it would have to be. She turns her head and looks into the darkness. Sleep is now coming. Angel wakes not in her bedroom, but some other place. Its warm, humid, a solid block of heat. She’s still in her night-things, a ragged old t-shirt that’s seen better days, and a pair of shorts – but she still feels overdressed. Is this what being on holiday is like, warm and sticky. Someone hands her an ice cream and she takes it like it’s something that happens everyday. Beside her is a pair of sunglasses, she puts them on. Now she can see into the distance, beyond the heat haze. She’s sitting at a hotel pool, one of those large kidney shaped pools, with a diving board. The water undulates, plastic inflatables bob on its surface. People sit beneath umbrellas, on loungers, exactly the same as hers. She closes and opens her eyes. The scene has vanished, all she sees now is a cold dark wall, the blankness of her bedroom at night. Harry is away for two weeks and a day, giving her time to see what magic could happen. Angel closed her eyes again and entered a dreamless sleep. In the morning she placed the machine back in its hiding place. Play-centre felt dull and colourless. There was no warm humid climate, no free ice creams. The day felt monotonous, too real and boring. She tried to join-in with the programmed activities, but painting a plate felt more like a chore. Angel felt remote, distanced from all the action of the day, only her dream felt real. “I made a plate,” she said with as much enthusiasm as she could muster. “Wow that’s….,” but her mums voice trailed off, she’d become distracted by her buzzing phone. Angel watched her mum as she played a word in her scrabble game. Once again she was getting mum’s half-divided attention. Something that can only be described as an itch afflicted her most of the night. All she wanted was permission to sleep, and return to her exotic sun drenched holiday. Mum paid for a new TV movie, ordered a take-away pizza – but the drag of the day ploughed into the night. Nothing really excited her or grabbed her attention. The movie stunk. The pizza was greasy. Nothing matched that moment on her dreamy sun lounger. After the film was through, they both shipped languidly to bed. There was something about the light in her room; a tangerine orange, that peeled slowly to reveal a night-time scene. Coloured lights traced the edges of her kidney shaped pool. Instead of a lounger she found herself seated at a small plastic table. She consciously kept her eyes open so the vision would be more than a fleeting sensation. Warmth and humidity enveloped her body. Large insects danced on the pools surface. In the distance dim lights glowed. If she screwed her eyes-up really tight, she could see balconies and windows – hear the sounds of human occupation. Shadowy figures moved about. It was the time when holiday people washed away the days sweat. Did their hair and dressed for the evening. Because on holiday everyone went out at night. Harry had described how children, even the very young, went out way past bedtime. It was normal he said. When she’d asked why it was normal not to have normal bedtimes, he had no answer. Angel wasn’t sure if the shadow people sensed her presence – or if she was invisible. Someone handed her a long glass with a crooked straw and miniature umbrella. She turned to say thank you, but the person was gone. A mock-tail – a children’s cocktail – alcohol free – exactly as Harry had described. If you close your eyes, and drink slowly, you will know what its like to be truly on holiday. But Angel resisted her friend’s advice, she wanted to see for herself what went on inside those lighted rooms. She wanted to see people go out at night, the way Harry described. But as she walked towards the nearest door – the vision vaporised and she was back at home, tucked inside her boring bed, staring at a boring blank wall. No amount of eye closing or concentration could restore the hotel and its pool. Angel spent the next day concocting ways of spending more time on holiday than in her real and boring life. She wanted to join Harry before he was due back home. So that night she chose some summery shorts and a t-shirt. She put a pair of flip flops and a bottle of Sun Lotion at the side of her bed. Surely if she came prepared the magic would work. How do you make the thing stronger if its so close, just under a pillow, almost next to her head. Simple – wear it. But of course Harry had warned her never to wear the silver machine – and especially at night when its powers became stronger. Angel sat-up and read, hoping to fool her brain into thinking about something else. But the glove was just too powerful. She felt a tingling rush through her body – and exit out through her toes. “Wheew,” she said, before thinking once again about lights surrounding her holiday swimming pool. Maybe Harry was being over cautious when he said don’t wear the glove, maybe he was just being an overprotective big brother – he sometimes spoke to her like an older brother – and she played along with it – somehow it felt comforting – a sort of wish fulfilment kind of thing. To actually have a sibling – an instant: playmate, companion, friend. And like a brother or sister, Harry could be overprotective. The word steal was never used, but sometimes Harry looked distrustfully at her when she handled his possessions. And that’s what surprised her most about Harry giving her the silver machine – he’d never entrusted anything with her – not even a stone or a shell or something really small. So with all her willpower Angel directed her body and shot off in the opposite direction. Back through the window of what looked like her home. But it wasn’t, because inside there were hospital things, blinking lights and machines that beeped, and Harry shrivelled-up in a gigantic bed. She laughed, not knowing if that’s what he wanted. “What’s wrong Harry,” she said after regaining her composure. “What’s right Angel is more to the point,” he said using his robotic computer game voice. She could hardly see his lips move, everything about him was so small. Miniaturised – that’s what he was, and if she’d replied with a don’t be silly, he’d know it was a lie. A fake response. “Not true,” she said and she could feel Harry hesitate – taken aback by her forthrightness. He asked her if she enjoyed the holiday, he said she’d tested his fantasy’s boundaries by walking around, sampling the space. He lifted what had once been his arm, it looked like a metal angel poise lamp – a functional piece of tin. always connected. Harry was controlling her with his superior circuitry. But he was also trying to mimic human feelings – sort of romancing her with a tropical holiday. The humanoid still had a dash of human mixed-in with whatever he was made of. His left arm looked intact, even the fingernails were glowing, she touched it expecting the strangeness of a robot but instead got human flesh and blood warmth. The news about Harrys dad did explain his weirdness, but was hardly a surprise. “So you live with people and pretend to be human,” she said, hoping his answer was not going to be a yes. My old cat Charlie died yesterday. He was eighteen years old and had suffered a stroke. For the first eight of those years he lived with me, and for the next ten with my daughter. 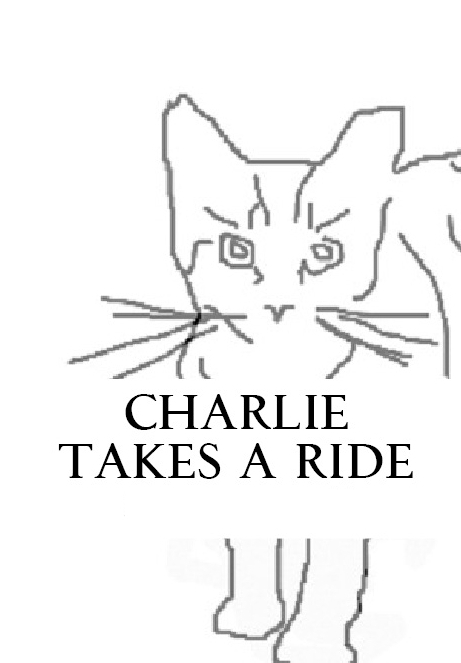 I wrote a childrens story featuring a cat named Charlie back when my daughter was three, but I never finished the illustrations. I’ve decided to upload the story and illustrations, as a tribute to old Charlie. You can read it here.